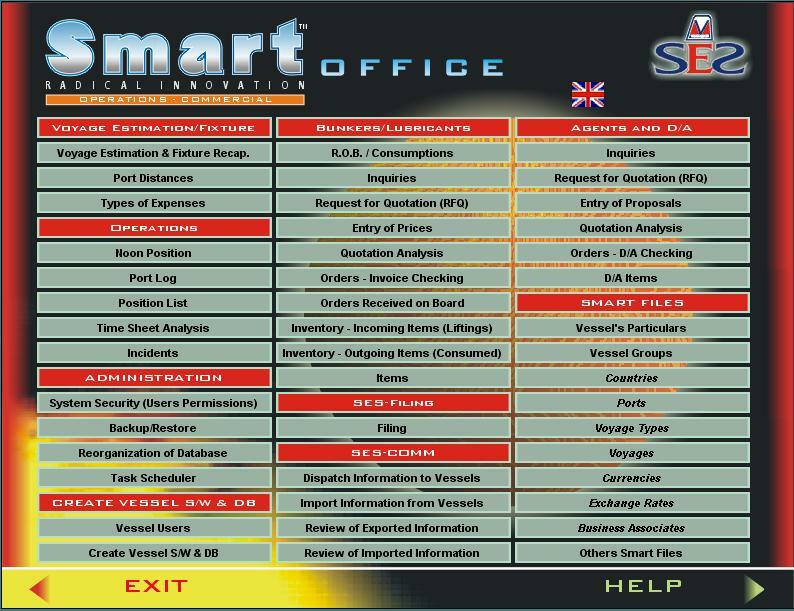 The Smart™ Operations-Commercial is a versatile and powerful, yet easy to use, package designed to satisfy in full the needs of Charterers and Operations Departments. The system comprises several modules which are fully integrated and further linked to the Smart™ Marine Accounting and Financials package in order to provide a seamless technological platform to assist and enhance the operations of a shipping company. The Voyage Estimation module allows for fast and efficient estimates on a voyage or time-charter basis and accomodates Sensitivity Analysis for swift on-line negotiations. Estimate printing and copying facilities are also included. The Fixture Recap & Voyage Orders module integrates the finalized voyage estimate option to the vessel's position report and time sheet analysis to support Port calls with ETA, ETS, Demurrage and dispatch rates, Lay can dates, Analysis of Receivables & Payables, etc. The Vessel's Position provides the full operations reports for Noon position, Loading, Discharging, Bunkering and allows the vessel's Position List to be viewed at any time required. The Agents & D/A module covers the entire cycle from RFQ from several Agents of a port to the order confirmation and up to D/A analysis checking. The Bunkers/Lubricants module assists in the daily procurement of bunkers, lubricants, chemicals and water, covering the entire cycle from Requisition to order and delivery on-board and beyond, to inventory and stock control allowing a per voyage calculation of consumptions, estimation of available sailing days per ROB quantities, etc. The system can be linked to Microsoft Outlook for incoming-outgoing mail monitor and classification into SES database and features further links for dispatching and importing information from vessels allowing for uniform and synchronous documentation.